What is the value of an artificial intelligence (AI) which can accurately recognize handwritten characters in essay/writing exams and do the “boring” work in automatic scoring and grading? Can DEEP READ, which uses AI technology based on deep learning, transform the educational testing and assessment landscape? Can DEEP READ find applications and users beyond the educational field? Aaron Levie’s Box Inc. (NYSE: BOX) has been searching worldwide for a long time for a solution for its enterprise secure cloud content management, file sharing and collaboration services beyond the conventional OCR (optical character reading) technology whose recognition accuracy of handwritten documents was low. 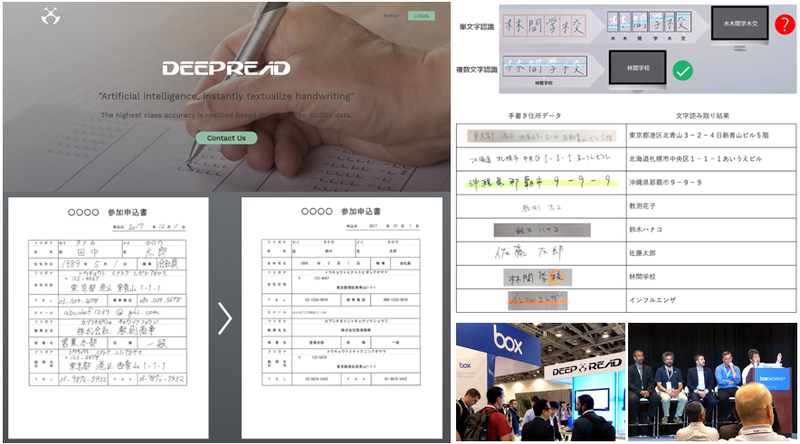 BOX was impressed by the accuracy of DEEP READ and collaborated with this Asian/Japanese listed AI innovator in August 2018 to utilize DEEP READ services to automate the digitization of handwritten characters for BOX users to make search in the cloud possible for more efficient document management. At BoxWorks2018 event held in San Francisco, many government officials who stored many old documents and enterprises that have problems in digitizing handwritten application documents tried out DEEP READ and gave very favorable reviews. DEEP READ reminds us a little of a listed cybersecurity innovator in our focused H.E.R.O. portfolio (which we have yet to write about) who began providing its new unique file encryption and tracking software as a SaaS cloud service on BOX on 6 March 2016 after first launching the software in 2012 – share price has quadrupled since March 2016 to a current market value of over US$1 billion and with more room to grow exponentially further. We are thinking aloud whether DEEP READ-in-the-BOX has the same potential. At a time when the old outsourcing model of supplying warm bodies in India/ASEAN to do data processing and maintain IT systems of American/multinational companies is dying, offshore BPO companies are reinventing themselves by infusing AI x RPA (robotic process automation) into their solution to better value-add to their clients. TIS Group’s (TSE: 3626) Agrex, a major BPO company with over 50 years operating experience, announced on 22 Jan 2019 that from April 2019, it will utilize DEEP READ to provide accurate and efficient data processing service and create new AI x RPA solutions to serve their clients. Financial companies, which account for about 60% of the customers of Agrex, are moving their handwritten paper application forms and documents towards automation by AI x RPA, while dealing with sensitive personal information such as bank information and credit card information. DEEP READ is also expected to be utilized in digitizing customer data and other handwritten forms in insurance companies and medical certificates/documents in hospitals. In DEEP READ’s core educational market, a major revamp is happening in the Japanese school system’s English-teaching regimen. From 2020 as Tokyo Olympics near, the university admission common test will change greatly, including the embodiment of the evaluation of the four skills of English (reading, listening, talking, writing). The standardized exams for the national language, Japanese, and mathematics will also include some writing elements in addition to the usual multiple-choice tests. MEXT (the Ministry of Education, Culture, Sports, Science and Technology) also made the drastic decision to hand over responsibility for assessing the English language ability of university applicants to private testing companies. By 2024, there will be a complete transition to English private examinations. Digital textbooks in schools will be official this year, and CBT (computer-based test) of various tests will be introduced at primary, middle and high school, including the English CBT National Achievement Test conducted nationwide in 2019. This week, we highlight the under-the-radar listed Asian exponential innovator EduLab (TSE: 4427) who is Japan’s leading EduTech innovator in e-testing and e-learning powered by its adaptive test technology and AI OCR handwritten character recognition technology DEEP READ that enables it to achieve high profitability with operating margin of 24.3%, ROE (= EBIT/Equity) 38.1% and ROA of 12.4%. EduLab provides test development, implementation, analysis, educational services of English and other competence tests through its focus on the R&D of ability measurement technology and educational tools in the education field for customers such as public examination organizations (Eiken Society/ Japan English Test Association; schools; MEXT; local governments; general corporations). EduLab, the parent company of JIEM (Japan Institute for Educational Measurement Research), is the Japanese equivalent of the Educational Testing Service (ETS) in the U.S. which is the world’s largest educational testing and assessment organization. EduLab is also the creator of CASEC (Computerized Assessment System for English Communication) which is Japan’s first adaptive English test developed since 2001 and the number of examinees is over 2 million people (total number of examinees in tests contracted to JIEM is around 17 million people), and is also entrusted with the test scoring work for governments and educational institutions. Conventional OCR technology has low recognition accuracy in handwritten characters because of uneven handwriting. ALL other AI OCR companies tried recognition by one character at a time, but handwritten characters of Japanese/Chinese are connected to one another and the boundary of each character to each other was unclear. In addition, the Japanese/Chinese characters are constituted by a combination of characters. Also, if there is a ruled line, it will be difficult to separate letters if it overlays a border line. Distinctive from every other AI technology, DEEP READ recognize handwritten characters not only by each character but also the context of the text before and after the character, as well as by analogy from the flow of sentences and the relationship of letters. DEEP READ succeeded in raising the accuracy of handwritten character recognition by letting the AI deep learn the context of sentences with the same flow as humans are reading them. DEEP READ differentiates from most AI OCR companies who do not have handwritten character recognition technology, such as NZ-based Xtracta (~US$4m revenue), Singapore-based TAIGER (~US$6m revenue with clients such as Singapore’s Housing and Development Board HDB), Germany’s ITyX Solutions (~$10m revenue with clients such as Bosch Communication Center, IKEA, Allianz). Prominent AI OCR firms with handwritten character technology include Japan’s Cinnamon (which we shared briefly last week), Japan’s Cogent Labs and San Jose-based Infrrd (~US$5m revenue). After Andreas Schleicher, the OECD Education and Skill Director also known as “Mr. PISA” for devising the PISA (Programme for International Student Assessment) survey, visited Saitama Prefecture in July 2017, he insisted on the necessity of collaboration with EduLab. EduLab was entrusted by the Saitama prefecture who conducted an academic achievement survey in July 2018, which is a groundbreaking study that measures the “growth in academic ability” of individual students utilizing IRT (item response theory) computerized adaptive test that can accurately measure the test examinee’s ability regardless of the difficulty of the test by automatically changing and analyzing test questions according to the individual’s abilities, which releases educators/parents from the spell that deviation from the average (e.g. score is plus 3 points from the prefectural average) is the measurement of “growth”. Data of about 300,000 students are collected and analyzed. The entire Fukushima prefecture has entrusted EduLab to carry out the same computerized adaptive test assessment and we believe that eventually all 47 prefectures in Japan will entrust EduLab. The Saitama prefecture groundbreaking survey also drew attention from the world and based on Mr. PISA’s excitement, there is the possibility that the new academic ability research created by Saitama Prefecture will become an influence on the educational policy of the world in the future. EduLab achieved a 15% yoy increase in sales and 63.9% yoy rise in operating profit in FY2018/09 with improving operating margin from 17% to 24.3% and ROE (= EBIT/ Equity) of 38.1% and ROA of 12.4%. On 8 Feb 2019, EduLab announced its 1Q FY2019 results in which sales increased 30% yoy but a optically weak set of earnings due to several one-off expenses such as IPO listing expenses which will continue to weigh on short-term volatility in share price. Management remains confident in maintaining its FY2019/09 sales to rise 71.6% yoy to 6.81bn yen and operating profit to increase 46% to 1.4bn yen. Given that many domestic educational institutions have their fiscal year end as of March, there is seasonality in EduLab’s business in which sales tend to concentrate towards the fourth quarter. Since around 2015, EduLab has been transforming to a profit-sharing business model, partnering up to grow with its customers (mainly the Eiken Society), receiving performance-based license fees linked with the number of candidates, the number of organizations, and the number of months of usage. However, despite the healthy structural long-term growth, EduLab is in our broader watchlist of 200+ companies and not in our focused H.E.R.O. portfolio of 40 companies. 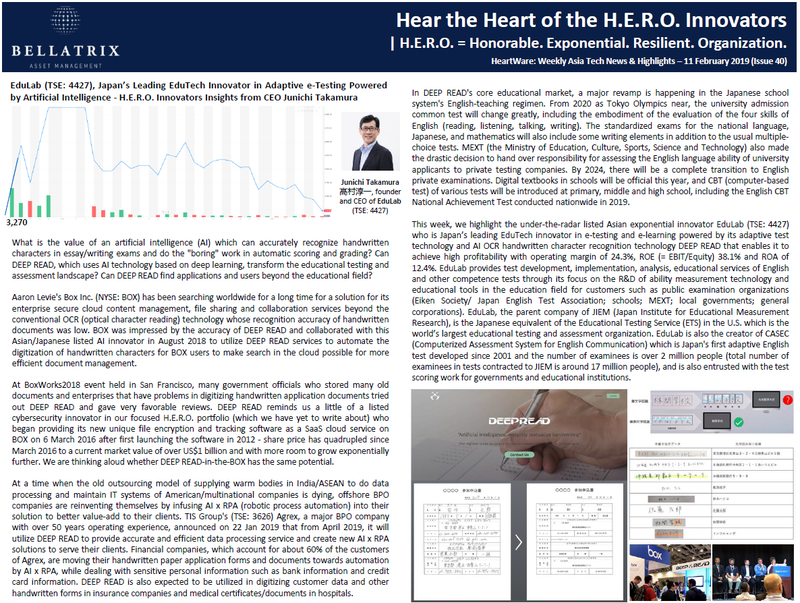 Thus far, of the 60 entrepreneurs and CEOs whom we had highlighted in our weekly research brief HeartWare, around one-third are in our focused portfolio of 40 HERO Innovators, while the rest like EduLab are in our broader watchlist of 200+ stocks. Although we are generally very cautious of private providers of public good services such as education, we like educational digital testing and assessment business model which enjoys recurring high-margin low-capex scalable service without the usual set of crippling problems, such as predatory marketing to acquire customers, moral hazard, inability to scale quality teaching service etc, that plagued and eventually doomed private educational schools. As mentioned earlier, EduLab is the Japanese equivalent of the powerful and highly profitable Educational Testing Service (ETS) in the U.S. which is the world’s largest educational testing and assessment non-profit organization and “multinational monopoly” behind the TOEFL, TOEIC, GRE – ETS is the type of business that Buffett-Munger would find highly interesting to invest in if it were private. We very much prefer another Asian listed innovator (which we have yet to write about) who provides the computer-delivered globally recognized English language test for study, work and migration purposes, because it has direct relationship and deeper engagement with the end users and international students with its digital platform – and the superior working capital dynamics translates to powerful free cashflow generation. (1) Korean listed cybersecurity and fintech innovator (EBIT margin 25.4%, ROE (= EBIT/Equity) 15.9%, ROA 11%, net cash is 14.1% of market cap) who monopolizes mobile digital authentication services (which allowed smartphone users of all three Korean telecom firms to sign into websites free of security threats and and removing fears of privacy/identity theft), as well as commands a 90% dominant share in virtual bank account settlement, which is the second most widely used means of electronic transactions in Korea following credit/debt cards. (2) China listed AI software company (EBIT margin 17.2%, ROE (= EBIT/Equity) 10.8%, ROA 8.8%, net cash is 3.7% of market cap) that outsmarted China’s #1 AI champion iFlyTek to command over 50% domestic market share in its niche business field. Going deeper beyond the thematics, we wish to share our findings primarily because it defused one of the governance bombs when it finally decided to dispose of its 48% stake in a Guangzhou IT company that is listed on the domestic NEEQ OTC board/新三板 (a hotbed for financial fraud) for RMB12.32m in a recent announcement on 23 Jan 2019. This Beijing-based AI innovator had first invested in the Guangzhou firm in July 2013. While the deal may seem small relative to its US$1.7bn market value, loan guarantees and related-party loans were made by the Beijing parent which complicated the relationship. There were two other major acquisition deals (49% and 90.185% stake) that this Beijing firm had made in the bull year of 2015 which we have some concerns, though there is another acquisition of an IT company (100% stake) in Aug 2017 which we find interesting. We have monitored this AI firm for over 5 years in our watchlist and we are now revisiting its potential. On a separate note, following initial enthusiasm and subsequently poor fundamental and market performance and non-existent liquidity of many companies after they were included in the NEEQ board, including the most serious fraud case of Shenxianyuan, the new Shanghai Tech Innovation Board/科创板 with loose listing rules (regulators will relinquish their responsibilities in assessing the applicants’ earnings potential) for unprofitable tech startups and pre-revenue biotech startups to raise capital may run the risk as yet another attempt to shift risk to and inflict damages on investors after the initial fanfare. Our emotional labor of love over the past months in sharing openly our research ideas (to battle-test our ideas by critiques and avoid blindspots in investing) and setting up the proper regulated and transparent UCITS fund structure to protect investors’ interests has deepened our conviction for the positive change that we will make together with H.E.R.O. – and we are getting closer to giving birth in March 2019 to H.E.R.O., the only Asia SMID-cap tech-focused fund in the industry and guarding investors’ interests in the regulated UCITS fund structure with daily NAV & daily liquidity and no exit fees. “We are providing technologies for taking exams on the Internet for companies which allows us to test reliability and validity in a short time. We offer programs such as ‘English Navi’ for Eiken Society, the Japanese English Test Association, which is our pillar of revenue from technology licensing. We would like to advance the development of artificial intelligence (AI) technology to capture the demand of the education industry that is lagging behind in IT. We are developing our own AI to incorporate in our program, and we can provide flexible systems according to customer’s needs. Taking advantage of the character recognition technology cultivated through the development of AI technology and automatic scoring technology for handwritten tests, we will capture the demand for automation of increasing administrative work in the financial industry, insurance industry and healthcare industry,” comments Junichi Takamura, founder and CEO of EduLab (TSE: 4427). (5) TEAP CBT (2.8%, -29.6% yoy) (Test of English for Academic Purposes – Computer Based Testing) which is jointly developed and operated with Eiken Society and Sophia University, and mainly intended for recruitment at educational institutions such as universities that conduct university entrance examinations for high school third graders e.g. 27 schools in the private Sophia University. (B) Test operation & Contract (26% of sales): EduLab is entrusted with the creation, scoring, aggregation and system construction, management and operation of test questions from national and local governments that implement academic ability research projects, as well as public institutions, universities and other educational institutions, such as the Eiken Society, achievement survey (PISA), international adult competence survey (PIAAC), international mathematics and science education trend survey (TIMSS), Saitama prefecture academic ability survey utilizing IRT, etc. Since Jan 2018, the AI OCR automatic scoring technology was utilized for “English 4Skills” learning service developed and operated jointly with NTT docomo. There is an enhanced English learning demand for qualification and examination test in a paradigm shift in the education industry with the structural change of the external educational environment that include a new university admission common test from the fiscal year 2020 to include the qualification and examination test of the four English skills, adding ‘talk’ and ‘write’ to the two skills of ‘read’ and ‘listen’; introduction of digital textbooks and CBT of various tests at primary, middle and high school; conversion of textbook into English curriculum in the fifth and sixth grade of elementary school and English is compulsory in the third and fourth grade. EduLab’s business model until 2015 was a contract type that does not incur business risk after delivery of digital services, receiving contracted development fee, maintenance and operation fee. It was a relatively simple profit model that sales would increase if the number of entrusted projects increased. Since around 2015, EduLab has been transforming to a profit-sharing business model, partnering up and taking business risk to grow with its customers (mainly the Eiken Society), receiving performance-based license fees linked with the number of candidates, the number of organizations, the number of months of usage. Given that many domestic educational institutions have their fiscal year end as of March, there is seasonality in EduLab’s business in which sales tend to concentrate towards the second quarter and fourth quarter. EduLab achieved a 15% yoy increase in sales and 63.9% yoy rise in operating profit in FY2018/09 with improving operating margin from 17% to 24.3% and ROE (= EBIT/ Equity) of 38.1% and ROA of 12.4%, propelling a 11.6% increase in market value since its listing on 21 Dec 2018 at the IPO price of 3,270 yen per share to US$273m. Balance sheet is moderately geared with net debt of 1.413bn yen (gross cash 3.125bn yen, gross debt 4.538bn yen), or 4.5% of market value. Management expects FY2019/09 sales to rise 71.6% yoy to 6.81bn yen and operating profit to increase 46% to 1.4bn yen. NTT DoCoMo and Obunsha, a major educational publishing company founded in 1931 with its English textbook for college entrance examination achieving #1 in bookstore sales, are strategic shareholders with 5.06% and 6.34% respectively. Together with NTT docomo, EduLab provides “English 4Skills” for college entrance examination and AI automatic scoring technology. EduLab also provide subjects other than English in a joint project with Obunsha in offering free animation-based multi-disciplinary learning application for elementary and junior high school students under the ‘Study Gear’ brand. EduLab also provides achievement tests for elementary and junior high school students in self-study classroom projects in China and India. In April 2018, EduLab established a venture investment base in Boston to invest in EdTech venture companies. EduLab has adopted a stock option scheme to incentivize and align the management and staff. The number of potential shares by stock acquisition rights is 1,024,400 shares, which is equivalent to 13.58% of the total number of issued shares of 7,542,600 shares. EduLab was founded in 2000 by Junichi Takamura and Hiroshi Matsuda. DEEP READ competes with Japan’s Cinnamon which claims around US$3m in revenue and over 200 clients. Founded in Oct 2016 by Miku Hirano, Cinnamon’s core SaaS cloud product is Flax Scanner, an AI auto-documentation tool launched in April 2017 that understand context and reformat the documents from unstructured business documents and email for both handwriting and text data. Cinnamon claims high recognition accuracy for hand-written reading of 95-98% for real business data. Cinnamon has raised over US$24m. DEEP READ differentiates from most AI OCR companies who do not have handwritten character recognition technology, such as NZ-based Xtracta (~US$4m revenue), Singapore-based TAIGER (~US$6m revenue), Germany’s ITyX Solutions (~$10m revenue). AI OCR companies with handwritten character recognition tech include Japan’s Cogent Labs and San Jose-based Infrrd (~US$5m revenue). (1) Under the development of the ICT environment at schools conducted under the 5 Year Plan 2018-2022 for the ICT conversion of education, it is expected that ICT will be actively utilized such as the introduction of digital textbooks, CBT of various tests at primary, middle and high school, including the English speaking CBT National Academic Achievement Survey conducted nationwide in 2019. (2) From the fiscal year 2020, it is expected that the ‘university admission common test’ will change greatly including the embodiment of the evaluation of the four skills of English (reading, listening, talking, writing). It is difficult to concurrently conduct the tests on the same day in large group at the exam center. Therefore, it is suggested to utilize private qualification and certification test which is already evaluating the English 4 skills, such as Cambridge English tests, TOEIC, TOEFL. By 2024, there will be a complete transition to English private examinations. (3) Due to the revision of the guidelines for teaching guidance, textbook will be converted into English curriculum in the fifth and sixth grade of elementary school and English is compulsory in the third and fourth grade. (2) alliances with strategic business partners. We have a long-term relationship with the Eiken Association, which is a representative corporation that works to train English proficiency, as a strategic business partner,. In addition, we have long-term partnership with Obunsha in the educational contents related business, and NTT docomo in the ICT education related business. CEO Takamura went on to share about EduLab’s EduTech investments in CodeMonkey, SpeakingPal, Authess, Listenwise, Academic Merit (Finetune) and ELSA: “Over the past few years, EduLab has invested as a limited partner in three U.S.-based education technology venture funds: LearnLaunch, Fresco Capital and GSV Acceleration. With the experience, EduLab has established EduLab Capital Partners based in Boston in March 2018 to be a general partner in creating our own edtech fund to focus on investments at the seed and Series A stages, with a specific interest at high-growth edtech and artificial intelligence-related startups. We have a small AI team in our Boston office that may work with some of the portfolio companies. We established EduLab Capital Management Company, LLC in Boston as a subsidiary of Edutech Lab, Inc. in America with the aim of accelerating investment in EdTech venture companies. In the past few years, we have invested in 4 companies in the US, 2 in Southeast Asia/China, 2 in Israel. These include Listenwise, a listening comprehension service that uses public radio programs as source materials; Authess, a digital, performance-based assessment tool; Academic Merit; ELSA; CodeMonkey and SpeakingPal.